With such a small population of Javan rhinoceros left, the species’ survival is threatened by low genetic diversity, the likelihood of inbreeding, and the potential of natural disasters. There are still major gaps in our knowledge about Javan rhinoceroses because they are extremely difficult to study and there’s a remote possibility that remnant, undiscovered populations exist. The Javan rhinoceros is generally solitary, except for mating pairs and mothers with their young. There is little sexual dimorphism in the Javan rhinoceros, however females have shorter, less prominent horns or may lack a horn, entirely. The Javan rhinoceros’ gestation and inter-birth intervals are unknown, but are presumed to be similar to other rhinos, with a single calf being born after a gestation of 15-16 months every 2-3 years. 60% of Eastern Asian doctors stock rhino horn, with Asian horns, like that of the Javan rhinoceros, preferred over those of African species. 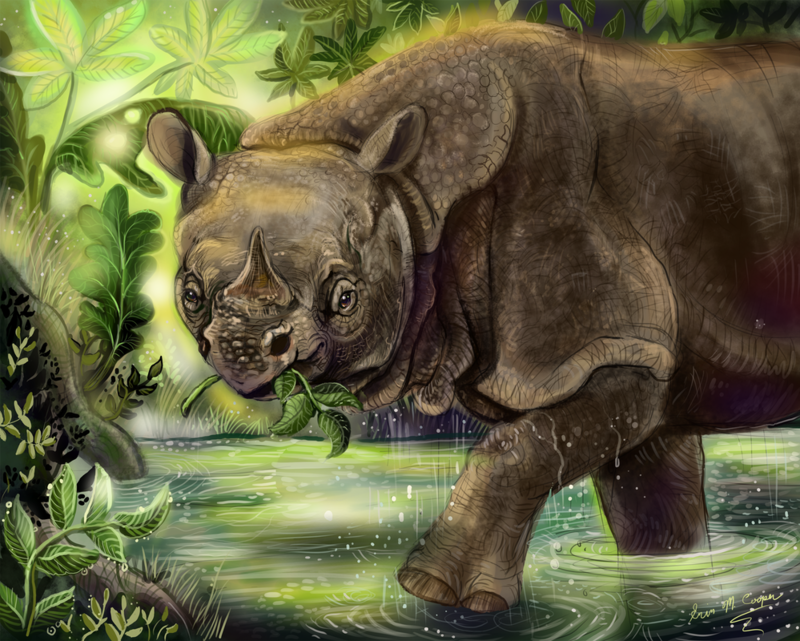 The Javan rhinoceros has a unique, prehensile, pointed, upper lip that functions as an aid for feasting and grasping onto leaves.